The America's Cup jury looking into allegations of cheating against Oracle Team USA has banned one Oracle sailor entirely and another for four races in the upcoming America's Cup Finals. The jury also penalized the team, the current Cup holder, 2 points in the best-of-17 match against challenger Emirates Team New Zealand. That means Oracle will have to win 11 races to emerge victorious, while Emirates will still have to win just nine. AP is calling the sanctions the "harshest penalties in the 162-year history of sailing's marquee regatta." The five-member international jury investigated illegally placed weights on its catamarans during the America's Cup World Series. (For background on the cheating scandal, Reuters did a good writeup last week.) Oracle forfeited two championships due to the rules violations. The sailor banned is Dirk de Ridder, the wingsail trimmer and a leading member of Oracle's crew, recognised as one of the best trimmers in the world. The other sailor excluded for four races is former Team New Zealand sailor Matt Mitchell. Shore crew Andy Walker (also a Kiwi) and Australian Bryce Ruthenberg have also been excluded from the regatta. The jury had harsh words for de Ridder, saying it was "comfortably satisfied" that the Dutch sailor "gave the instruction to add the weight, knew the weight had been added, knew it was a breach of the aC45 class rule and "did not tell the truth in the hearing in this regard." Read the Herald's full report for more on the sailors. “The rules infractions involved only a few of our 130 team members, and were done without the knowledge of either our team’s management or the skippers who were driving the boats. While we disagree with the unprecedented penalties imposed by the Jury, we have no choice but to make the necessary changes to personnel on our race boat and do our best to use the next four days for the new team to practice and get ready for the start of the 34th America’s Cup. "It sets an unbelievable precedent ongoing," Coutts said. "You could think of lots of analogies. Think of Olympic athletes on a team breaking the rules and a whole team getting penalized. It's completely outrageous." Ironically, Oracle last year pushed to add a rule about harming the sport's reputation. Dubbed the "the Dalton rule," some say it stemmed from the American team's effort to muzzle Grant Dalton, New Zealand's outspoken managing director, who has repeatedly criticized the 2013 America's Cup event. The Dalton rule empowers the jury to punish Oracle by subtracting points before the best-of-17 races begin. Ellison's Oracle team, as defending champion, had the right to set the rules, specify boat design and choose the venue for this year's competition. The jury also ruled that Oracle must pay a fine in the form of a charitable donation of $125,000 to the Andrew Simpson Sailing Foundation and $125,000 to a charity "selected by the mayor of San Francisco to provide support to at-risk youth in the San Francisco Bay area." 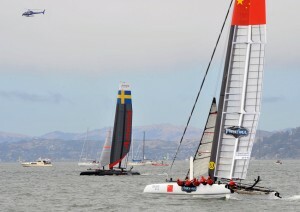 Simpson, the Swedish team's strategist, was an Olympic gold medalist who died in May after his boat capsized on San Francisco Bay while practicing for the Cup races. You can read the jury's full report here. One hates to be flip about this, but aside from the death, destruction, lack of competition, poor attendance, sponsor grumbling, disappointing economic benefits and now, apparently, poor sportsmanship, that's quite the head of steam the competition has built up going into the finals.